Have you ever wondered why some of the biggest problems we face, from illegal immigration to global warming to poverty never seem to get fixed? The reason is simple: the solutions just aren't very convenient. Fortunately, radio and television host Glenn Beck doesn't care much about convenience, he cares about common sense. Take the issue of poverty, for example. Over the last forty years, America's ten poorest cities all had one simple thing in common, but self-serving politicians will never tell you what that is (or explain how easy it would be to change): Glenn Beck will. Global warming is another issue that's ripe with lies and distortion. How many times have you heard that carbon dioxide is responsible for huge natural disasters that have killed millions of people? The truth is, it's actually the other way around: as CO2 has increased, deaths from extreme weather have decreased. Bet you'll never see that in an Al Gore slideshow. An Inconvenient Book contains hundreds of these same 'why have I never heard that before?' type of facts that will leave you wondering how political correctness, special interests, and outright stupidity have gotten us so far away from the common sense solutions this country was built on. As the host of a nationally syndicated radio program and a prime-time television show on CNN, Headline News, Glenn Beck combines a refreshing level of honesty with a biting sense of humor and a lot of research to find solutions that will open your eyes while entertaining you along the way. Not as good as COMMON SENSE. Some part good, some parts silly. 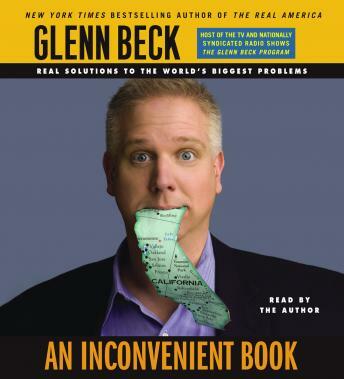 Unless you are a Glenn Beck fan, this audio-book has marginal appeal. While Mr. Beck's enthusiasm for his country seems sincere and honest, unfortunately his aptitude for humor is inconveniently average. He undercuts some of his best points with goofy highschoolish attempts at jokes and silly sarcasm. Too many cheap shots at environmentalists undercut his better, more sensible arguments for protecting our borders, cutting our government spending/defecit, and taking more seriously the radical Islamic extremist threat to American democracy. I thought this might be fun until I popped the first CD into the car box. First, the author's narration is so arrogant and smug and self-satisfied and sophomoric (I can keep going; please stop me!) that it immediately set my teeth on edge. Couple this with the obvious, sophomoric rhetoric meant to be funny -- something that sounds like a filibuster by a not terribly well-informed high school sophomore high on stimulants -- and you've got a real "I have no frontal lobe"-fest on your hands. I couldn't make it through the first CD; all I could think of while the CD was playing was slapping the obvious grin off the author's/narrator's face. A huge waste of time and oh so not-funny. This was a very entertaining book but kind of light weight. The first chapter is definately worth reading though. I would have enjoyed hearing Mr. Beck's take on politics, etc. but I could not get past his annoying narration. Perhaps I'll read the book.